To study the reasons of default in these patients using a semi-structured questionnaire. This is a cross-sectional study, which had been carried out in Mayurbhanj district of Odisha during June-July, 2006. The district compromises of 58% tribal population and 42% others. The district has been divided into seven TB Units. The secondary data was collected from District TB Office from various registers. Forty-one defaulters among 550 TB patients registered in 1 st and 2 nd quarters of 2005, covering all the seven TUs were included in the study, that is, 100% sampling. The case definition used was as per RNTCP guidelines: Default is defined as "a patient who at any time after registration has not taken anti-TB drugs for 2 months or more consecutively." The patients were interviewed at their home. In case of patients who had migrated or died, their family members/nearest neighbors were interviewed. The pre-tested questionnaire was administrated in obtaining information about the patients' socioeconomic and demographic profile, literacy status, drinking habits, problems in taking drugs regularly, and various other reasons for default. Data analysis was done with the help of statistical tools such as percentage and using Epi-info-(3.5.1). Chi-square test was used to evaluate significant difference between proportions, P < 0.05 was considered as statistically significant. The interview was conducted after obtaining verbal consent from the patients. The ethical clearance for the study was obtained from ethical committee of institution of NCDC. Out of 550 TB patients registered under DOTS in seven TB Units of 1 st and 2 nd quarter of 2005, 366 (66.5%) were male TB patients and 184 (33.5%) female TB patients. From the same cohort, 41 patients who defaulted from treatment, only 31 defaulters could be traced and interviewed (male 25, female 6). The overall default rate is 7.45%. The male patients (9%) show higher proportion of default as compared with female patients (4.3%) and was statistically significant (P value = 0.049), [Table 1]. In the age group of 40-60 years (10.7%), the default rate was higher followed by 20-40 years age group (8.1%) as shown in [Table 2]. The defaulter rate was higher in employed group (7.9%), which consists of farmers and laborers as compared with unemployed group (6.4%). There was a higher proportion of defaulters in areas where treatment centers were more than 5 km (10.3%) away compared with places where it was in less than 5 km (5.5%) distance and was statistically significant [Table 3]. Majority of defaulters were in intensive phase 30 (73%) as compared with continuation phase 11 (27%). Alcohol users show a higher default rate (10.3%) compared with nonusers (4.6%) and was statistically significant [Table 4]. 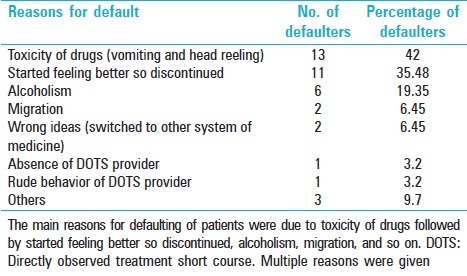 [Table 5] shows various reasons given by the patients for defaulting from treatment. A 42% patients defaulted due to drugs toxicity, that is, vomiting and head reeling followed by 35.5% patients who discontinued after feeling better, 19.35% due to alcoholism, 6.45% due to wrong ideas, 6.45% due to migration, 3.2% due to absence of DOTS provider, as well as 3.2% due to rude behavior of DOTS provider and other reasons (9.7%), which includes family problems, timing inconvenient, and carelessness. The present study highlights the problem of default during intensive phase and the potential reasons associated with default among the defaulters who are tribals. The overall default rate of 7.45% was observed in our study [Table 1]. This study has brought out the toxicity of drugs causing vomiting and head reeling as an important factor for treatment default (42%) as shown in [Table 5], which is in agreement with findings reported by Chandrasekharan et al. and Sukumaran et al. in their study. , Second most important factor for defaulting in our study was started feeling better so discontinued (35.48%)-similar finding has been reported by Kaona et al. in Africa. Missed doses due to alcohol addiction (19.35%) has been identified as an important factor in our study, which is similar to the findings by Vijay et al. Migration (6.45%) is another important factor, which contributes to defaulting. Jaggarajamma et al. has reported a similar finding. Migration is mainly due to occupational reasons. Irregular and incomplete treatment on account of migration is likely to increase the burden of TB in the community. In our study seven deaths among the defaulters were reported, which was higher compared with three deaths reported in study conducted by Chandrasekharan et al. Death occurred in five married males who were defaulters, which further adds to the socioeconomic repercussions of the disease on the family and the community at large. Extra efforts such as counseling, supervision, home visits, and motivation to retrieve patients likely to default during the intensive phase and return them to treatment would have ensured a favorable treatment outcome. Besides the above, the DOTS provider and patients need to be educated properly to overcome problems during the treatment. Frequent meetings of DOTS provider with Medical Officers of health facilities are the need of the hour to address these challenges in addition to improved monitoring and supervision and health education at grassroot levels with special focus to difficult and tribal areas. This study has brought out potential factors/reasons contributing to nonadherence during the intensive phase of the treatment among the illiterate and underprivileged population. Currently, the RNTCP program of India has many components. Outreach workers, referral systems, regular patient followup, and DOTS procedure are prominent features of the initiative. However, a more comprehensive approach, incorporating easier access to drugs, good capacity building of health care providers, effective solutions addressing travel-related concerns, modification of lifestyle behaviors, and emphasizing on motivating and counseling patients are essential for treatment completion among patients. I extend with gratitude my sincere thanks to Dr. S. Venkatesh, Director, NCDC, Delhi, Dr. Ravi Kumar and Dr S Hossain (MPH Faculty) NCDC, Delhi, for their close guidance and encouragement during my research on this topic as an MPH student. I thank RNTCP Team, Mayurbhanj, for their support and help during data collection. TB India (2006). RNTCP status report, RNTCP, Central TB Division. New Delhi: Ministry of Health and Family Welfare, Government of India; 2006. Park K. Park′s Textbook of Preventive and Social Medicine. 18 th ed.Jabalpur: BanarsidasBhanotPublishers; 2005. p. 146-61. Aggarwal SS, Aggarwal NS, Nagar SS, Makadia BK. Assessment of one year of RNTCP. Indian J Community Med 2004;XXIX: 164-5. Dye C, Scheele S, Dolin P, Pathania V, Raviglione MC. Consensus statement. Global burden of tuberculosis: Estimated incidence, prevalence, and mortality by country. WHO Global Surveillance and Monitoring Project. JAMA 1999;282:677-86. Harries AD, Maher D. TB/HIV: A Clinical Manual. Geneva: WHO Publication; 1996. Kaona FA, Tuba M, Siziya S, Sikaona L. An assessment of factors contributing to treatment adherence and knowledge of TB transmission among patients on TB treatment. BMC Public Health 2004;4:68. Vijay S, Balasangameswara VH, Jagannatha PS, Saroja VN, Kumar P. Defaults among TB patients treated under DOTS in Bangalore City: A search for Solution. Indian J Tuberc 2003;50:185-95. Chandrasekaran V, Gopi PG, Subramani R, Thomas A, Jaggarajamma K, Narayanan PR. Default during the intensive phase of treatment under DOTS programme. Indian J Tuberc 2005;52:197-202. Chatterjee P, Banerjee B, Dutt D, Pati RR, Mullick AK. A comparative evaluation of factors and reasons for defaulting in TB treatment in the states of W. Bengal, Jharkhand and Arunachal Pradesh. Indian J Tuberc 2003;50:17-22. Pandit N, Choudhary SK. A study of treatment compliance in directly observed therapy for tuberculosis. Indian J Community Med2006;31:241-3. Jaggarajamma K, Muniyandi M, Chandrasekaran V, Sudha G, Thomas A, Gopi PG, et al. Is migration a factor leading to default under RNTCP? Indian J Tuberc 2006;53:33-6. Raviglione MC, Harries AD, Msiska R, Wilkinson D, Nunn P. Tuberculosis and HIV: Current status in Africa. AIDS 1997;11(Suppl B):S115-23. Sukumaran P, Venugopal KP, Manjooran RS. A social study of compliance with DOTS. Indian J Tuberc 2002;49,205 7. NinanBS. Determinates of treatment non-compliance among pulmonary TB patients in RNTCP DOTS, Trivandrum, Kerala, India. Indian J Tub 2001. Available from: http://www.dspace.sctimst.ac.in/jspui/handle/123456789/2254. [Last accessed on 2015 March]. Vijay S, Balasangameswara VH, Jagannatha PS, Saroja VN, Kumar P. Treatment outcome and two and half years follow-up status of new smear positive patients treated under RNTCP. Indian J Tuberc 2004;51:199-208.